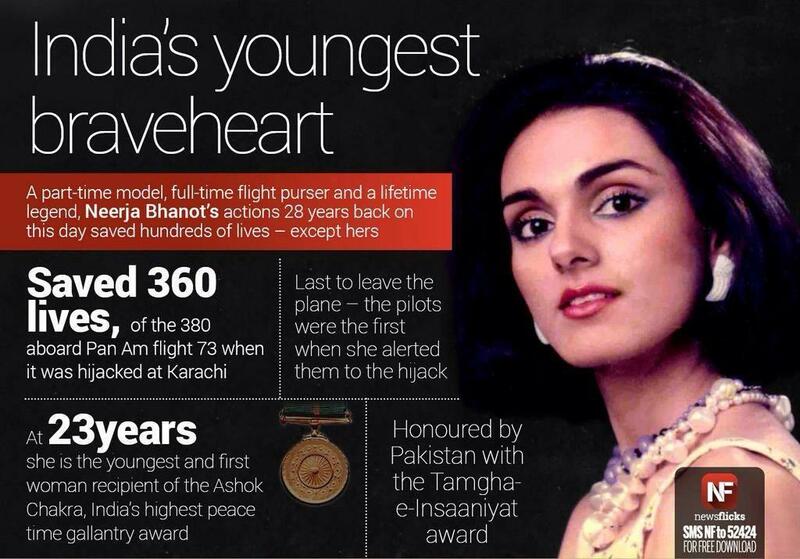 Neerja Bhanot was born on September 7th 1963 in a Brahmin family to mother, Rama Bhanot and father, Harish Bhanot. 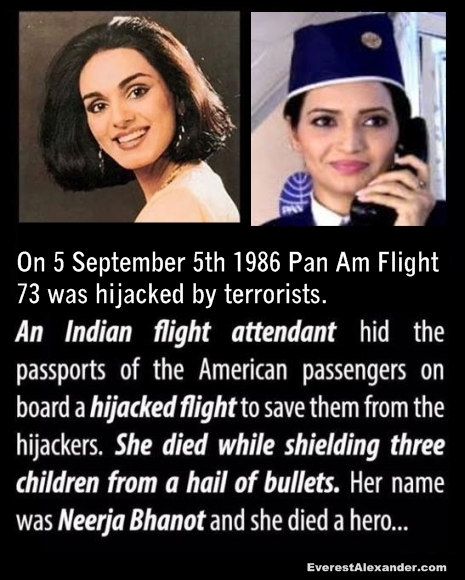 Neerja was the senior flight purser on the ill-fated Pan Am Flight 73, which was hijacked by four terrorists after landing at Karachi from Mumbai. PA 73 was en route to Frankfurt and onward to New York City. Bhanot alerted the American cockpit crew about the hijack and, as the plane was on the tarmac, despite being tackled, she helped the three-member cockpit crew of pilot, co-pilot and the flight engineer escape from the aircraft. Bhanot, being the most senior cabin crew member left on board, then took charge. The hijackers were part of the Libya backed Abu Nidal Terrorist Organization and instructed Neerja to collect the passenger’s passports so they could identify the Americans. She and the other attendants under her charge hid the passports of the 41 Americans on board – some under a seat and the rest down a rubbish chute so the hijackers could not differentiate between American and Non-American citizens. She could have been the first to jump out when she opened the door but decided rather to stay and help and eventually laid down her life while shielding three children from a hail of bullets fired by the terrorists. The hijackers were captured by Pakistan, tried, convicted and sentenced to death in 1988. Their sentences were later commuted to life in prison. In 2001, Zayd Hassan Abd Al-Latif Masud Al Safarini, one of the hijackers who shot the passengers, was captured by the FBI in Bangkok after being released by Pakistan. He is currently serving 160-year prison term in Colorado. Four others were freed from Pakistan’s Adyala Jail in January 2008. The FBI announced a $5 million bounty on their heads. Neerja Bhanot was recognized internationally as “the heroine of the hijack” and is the youngest recipient of the Ashok Chakra Award, India’s highest peacetime military decoration awarded for valor, courageous action or self-sacrifice away from the battlefield. In 2004 the Indian Postal Service also released a stamp commemorating her. With the insurance money and an equal contribution from Pan Am for using their brand name in the title, Bhanot’s parents set up the Neerja Bhanot Pan Am Trust. The trust presents two awards every year, one for a flight crew member, worldwide, who acts beyond the call of duty and another to an Indian woman who, when faced with social injustice helps other women in similar social distress. A square called Neerja Bhanot Chowk is named after her in Mumbai’s East suburb by the Mumbai Municipal Corporation. It was inaugurated by Amitabh Bachchan in the early 1990s. In 539 BC, King Belshazzar of Babylon saw a dismembered hand writing four prophetic words on the wall. This handwriting on the wall was finally interpreted by the prophet Daniel as predicting the fall of the kingdom. He was right. Babylon fell to the Medes-Persians that very night. Like the “handwriting on the wall” that Prophet Daniel had interpreted, there are four Arabic words, which could lead to submission of the entire world to Islam, if non-Muslims do not fully understand their meaning and implications. Those words are takiyya, tawriya, kitman, and muruna. Each of these words describes a different style of deception used by Muslims when discussing Islam or their activities as Muslims. Tawriya is defined as concealing, and it could be called “creative lying”. It is OK to break the intent of the oath, as long as you don’t break the letter of the oath. (Reliance of the Traveler, sections o19.1 and o19.5) How does this work? Suppose someone protests that Surah 1 of the Quran demeans Christians and Jews, because it is a supplication Muslims make to Allah seventeen times a day to keep them from the path of “those with whom God is angry” and “those who have lost their way”. A Muslim might respond, “Surah 1 never mentions Jews or Christians.” He is practicing tawriya, because while Surah 1 does not mention Jews and Christians by name, but he knows full-well that the words “those” refer to Jews and Christians. Another example would be when a Muslim responds to your greeting of “Merry Christmas!” He might say, “I wish you the best.” In your mind, you think he has returned a Christmas greeting. In actuality, he has expressed his wish for you to convert to Islam; he wishes the best for you which, in his view, is becoming a Muslim. Kitman is characterized by someone telling only part of the truth. The most common example of this is when a Muslim says that jihad really refers to an internal, spiritual struggle. 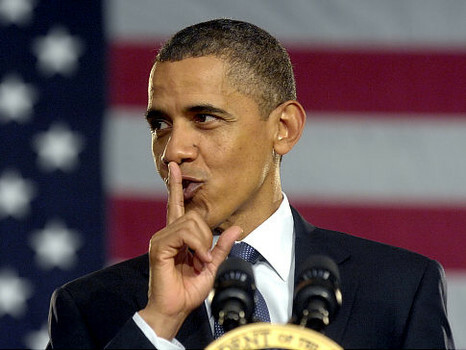 He is not telling “the truth, the whole truth, and nothing but the truth”, as witnesses are sworn to do in U.S. courts. Often, kitman results in a gross distortion of the truth. In the example given, the Quran uses jihad and its derivatives 59 times. Of those, only 16 (27%) could be considered “internal” with no object as the target of the struggle based on the context of the surah. Muruna means using “flexibility” to blend in with the enemy or the surroundings. 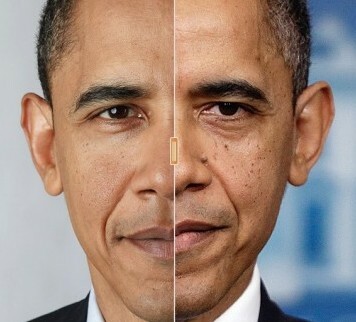 The justification for this kind of deception is a somewhat bizarre interpretation of Surah 2:106, which says, “If we abrogate a verse or cause it to be forgotten, We will replace it by a better one or similar.” Thus, Muslims may forget some of the commands in the Quran, as long as they are pursuing a better command. Muslims striving to advance Islam, therefore, can deviate from their Islamic laws in order to cause non-Muslims to lower their guard and place their trust in their Muslim counterpart. At times, Muslims practice muruna in the same way a chameleon changes colors to avoid detection. Muslims will sometimes shave off their beards, wear western clothing, or even drink alcohol to blend in with non-Muslims. Nothing is more valuable these days to the Islamists than a blue-eyed Caucasian Muslim willing to engage in terrorism. Another common way of using muruna is for a Muslim to marry a non-Muslim or to behave like a non-Muslim so their true agenda will not be suspected. The 9/11 hijackers visited strip clubs and bars during their off-times while taking classes in the U.S. to fly airplanes into the World Trade Center, the Pentagon, and the White House. Many Americans believe Hillary Clinton’s aide, Huma Abedin, married Jewish Congressman Anthony Weiner at least in part to burnish her security credentials so she could infiltrate the highest levels of the Administration. The implications of these highly-honed tactics of deception could be enormous for unassuming Western societies. Twenty years ago, psychologist Paul Ekman wrote an insightful book, “Telling Lies”, which demonstrated that people give off recognizable clues when they are practicing deceit. Their consciences cause them, involuntarily, to sweat or raise their voices or make other recognizable gestures. However, Dr. Ekman’s research was exclusively with people from Western cultures. Muslims, on the other hand, show no discernible signs when they are being deceitful because there is no feeling of guilt. In their minds they are doing exactly what Allah wants them to do to advance Islam. Because any Western person who has raised children knows almost intuitively when someone is lying, so they assume they can do that in all cases. Unfortunately, those same Western people can be easily duped by Islamic deceit because there are no tell-tale signs in the deceiver. Trust but verify – This was an old American strategy in dealing with potentially hostile parties. I believe this is the way to go in dealing with Islamists.